A Republican leader on the State Bond Commission expressed concerns Tuesday that Gov. Ned Lamont’s “debt diet” could stifle an important economic development grant for small Connecticut towns. Also Tuesday, Lamont followed his first bond commission meeting by making another appeal for bipartisan compromise on tolls to ensure a major rebuild of Connecticut’s aging, overcrowded highways, bridges and rails. 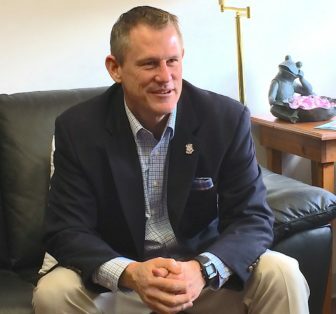 “We’ve neglected to look after some of the smaller towns in our state,” Sen. Kevin Witkos, R-Canton, told Lamont during the commission meeting. “It’s an important source of revenue for towns that are looking to do economic development,” said Betsy Gara, executive director of the Connecticut Council of Small Towns. Gov. Ned Lamont talks with reporters after Tuesday\’s State Bond Commission meeting. The legislature initially “authorizes” borrowing for STEAP and many other programs. The legislature has authorized $30 million in financing for the STEAP program, but the bond commission released no funding during the last 18 months of Gov. Dannel P. Malloy’s administration. Lamont first took office in January and Tuesday marked his first bond commission meeting — but STEAP funding wasn’t on the agenda. 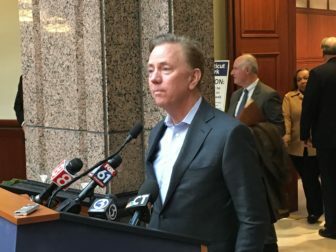 The new governor already has announced plans to put Connecticut on a “debt diet.” While the Malloy administration recommended about $1.6 billion in borrowing per year, Lamont has said he wants to maintain an annual limit of about $1 billion. “We have a skinny agenda because we have a skinny bond appetite,” Lamont said to open Tuesday’s meeting. 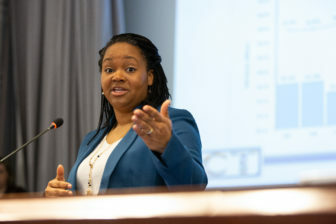 Lamont’s budget director, Office of Policy and Management Secretary Melissa McCaw, said the administration still is reviewing the STEAP grant authorizations and has made no final decision about whether to release the funds this fiscal year. Senate and House Republicans say Connecticut doesn’t have to wait four or five years to expand transportation work — and it doesn’t have to toll anyone. State funds for transportation construction work would swell from about $800 million per year to $1.4 billion annually under the GOP’s “Prioritize Progress” plan. In contrast, Lamont would essentially keep resources for transportation work constant over the next four or five years until toll receipts arrive. The Lamont administration appealed last week for a bipartisan compromise and the governor said Tuesday that “I’m all ears” on options that meet fiscal criteria. “I’m playing the long game,” Lamont said, adding that any alternative must provide a reliable funding source to pay for a long-term rebuild of transportation infrastructure. But Rep. Chris Davis of Ellington, ranking House Republican on the Finance, Revenue and Bonding Committee, said the GOP can’t compromise on tolls.